Spring has sprung, and we’re starting to crave lighter meals with bright, fresh ingredients. 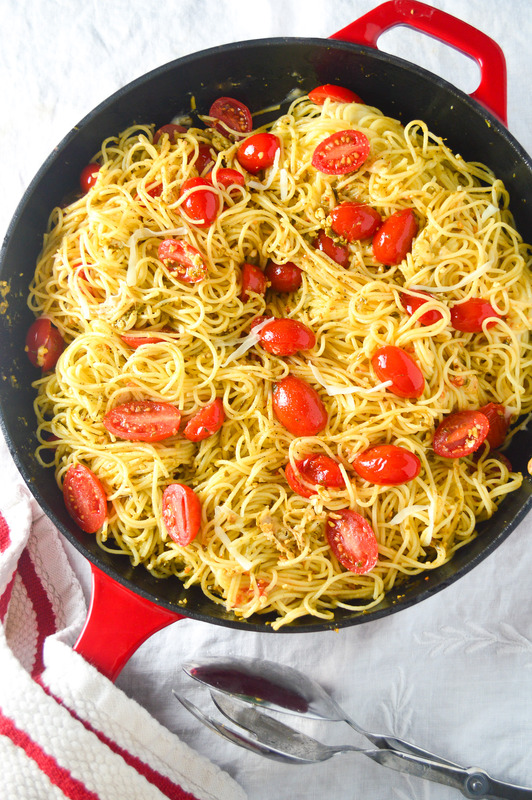 I was in the mood for a bowl of cheesy pesto pasta flavored with some grape tomatoes and garlic today. 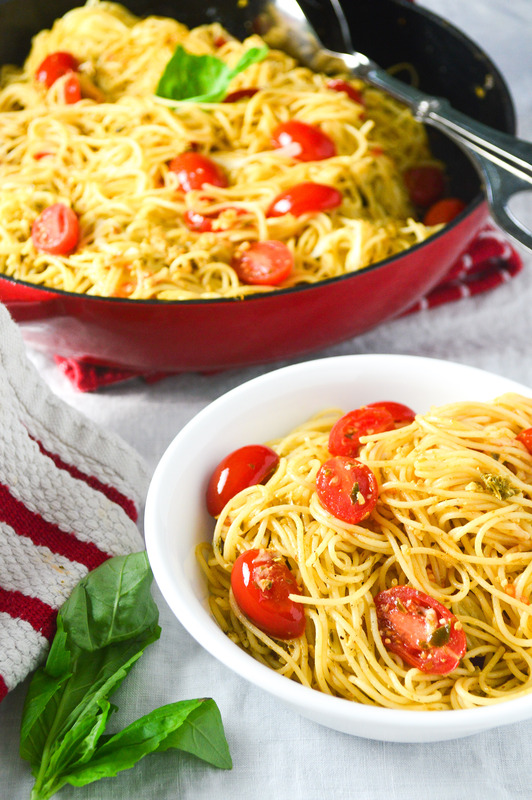 It’s amazing how 1 can of pesto can dress up a whole bowl of noodles. This recipe is about as simple as it gets; the whole thing took me under 20 minutes start to finish, and only requires a few basic ingredients. You can easily swap out your angel hair to make this dish gluten free, or bulk it up with chicken to make it heartier, but I thought the addition of grape tomatoes was all this recipe needed. Pesto is so full of flavor. Prepared canned pesto mainly consists of basil, olive oil, pine nuts, and parmesan cheese. Plus we’re adding in a cup of shredded mozzarella cheese. 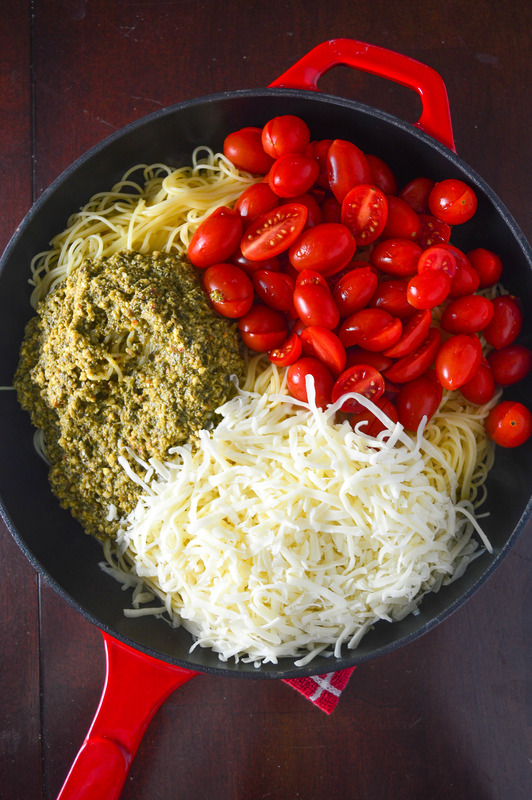 Cheese + pesto = gold. Start by cooking your angel hair pasta according to package directions. 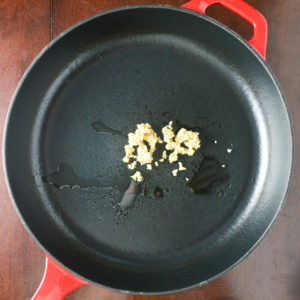 Meanwhile, heat up a large skillet and saute some garlic until fragrant. 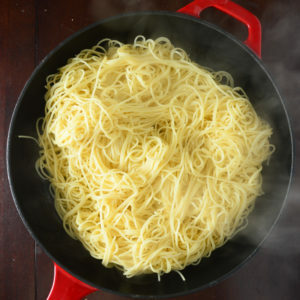 Drain your pasta and transfer into the hot skillet. Add in some canned pesto, shredded mozzarella, and halved grape tomatoes. You’ll want to use low-moisture, part-skim mozzarella to keep the water content down. Fresh mozzarella packed in water can clump up and water down the pesto. Keep it simple and buy pre-shredded cheese! And speaking of simple, pick up your favorite can of ready-made pesto sauce. You can certainly make your own, but this is a nice easy option. Gently toss everything together until well combined. Top with some freshly cracked black pepper. From start to finish, this whole dish took me under 20 minutes. I also think you’ll be able to get more like 6 servings out of this recipe, but I guess it depends how big your portions are. Enjoy! So simple, yet so delicious! 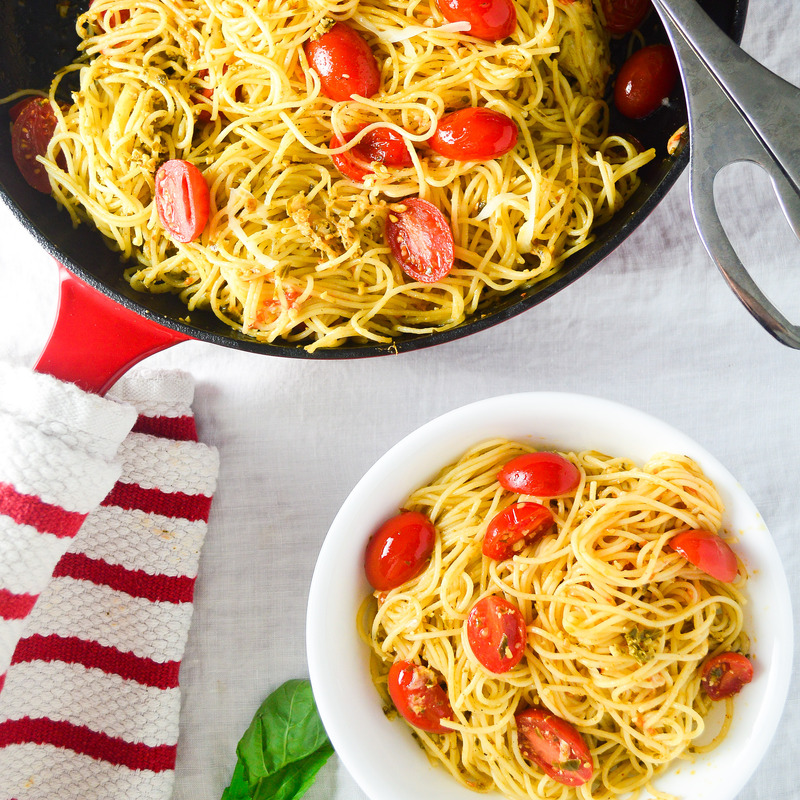 This easy cheesy pesto pasta took under 20 minutes start to finish. Prepare the angel hair pasta according to package directions. Meanwhile, in a large skillet over medium heat, add the olive oil and garlic and stir until fragrant, about 30 seconds. Reduce the heat to medium low. 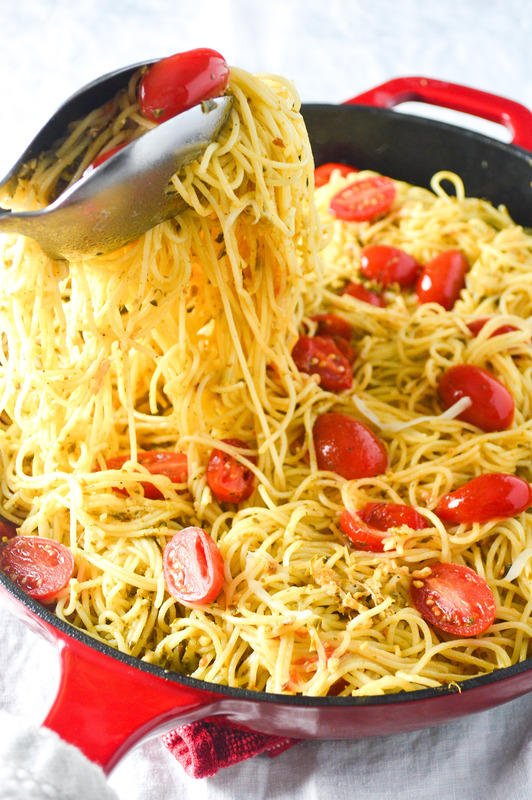 Drain the pasta and add into the skillet with the garlic. 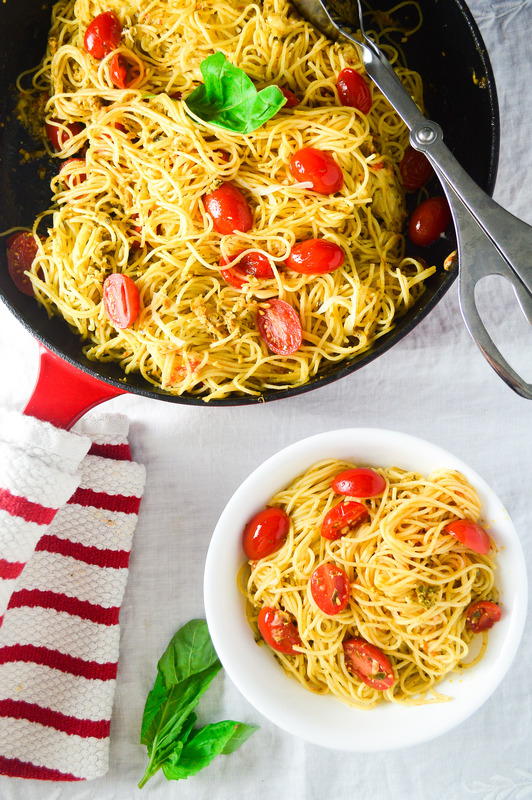 Add in the pesto, grape tomatoes, and mozzarella and gently toss everything together until combined. Serve pasta topped with fresh black pepper.